As a parent you work hard to provide for your family and keep your children healthy. 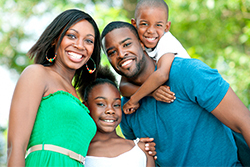 We can help you find community resources and information about health insurance for your family. Immunizations protect your child from serious illnesses. There are recommended immunization schedules. Find out where to get immunizations for your child. Learn more about immunizations and see the immunization schedules. It is important to find a child care provider that works for your family and that is affordable. Learn more about finding a child care provider in your area. Information and support for parents and caregivers who have a child with special needs or are concerned about child development. Learn more about special needs and find resources. Being a parent or caregiver is hard work. There are resources and support groups where you can meet other parents and caregivers and share your experiences. Learn more about parenting and caregiver support. Planning if, or when, you want to have another child can help you avoid the health and financial concerns associated with an unintended pregnancy. Learn more about finding free and low cost birth control services. Washington State has health insurance programs that provide free or low cost health insurance to children and adults who meet the income guidelines. You may qualify for these programs. Learn more about free and low-cost health insurance. If you need help buying food, you may qualify for the Women, Infants, and Children Nutrition Program (WIC) or the Basic Food Program (Food Stamps). Learn more about food assistance. Good dental health is an important part of your child’s overall health. Read more about what you can do to keep your child’s teeth healthy. Learn more about your child's dental health.